Transform your dining space when you bring home this handsome industrial style counter height table. 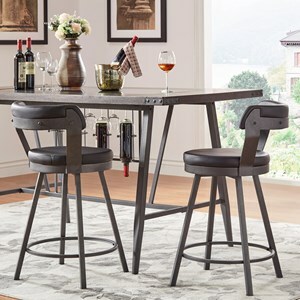 Exposed rivets adorn the corners of the tabletop and provide the piece with personality while wine bottle and stemware storage make hosting a breeze. A glass insert on the table top combines with the counter height and open design to help your dining space look and feel bigger as well as create a more casual, welcoming, environment. 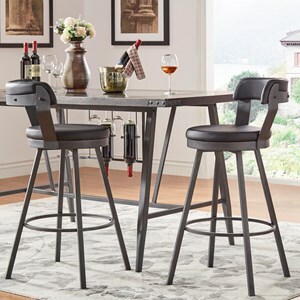 The 5566 Counter Height Table with Wine Storage and Glass Insert by Homelegance at Hudson's Furniture in the Tampa, St Petersburg, Orlando, Ormond Beach & Sarasota Florida area. Product availability may vary. Contact us for the most current availability on this product. Case Construction Constructed with a metal base. Finish Metal is finished in grey. Exposed rivets pair with a grey finished metal to create a handsome industrial style in this collection. Each piece features an open design that creates a welcoming feeling and allows extra light to flow through helping your space to look and feel bigger. 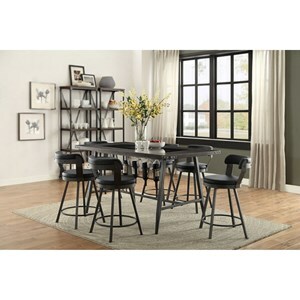 The 5566 collection is a great option if you are looking for Industrial furniture in the Tampa, St Petersburg, Orlando, Ormond Beach & Sarasota Florida area. Browse other items in the 5566 collection from Hudson's Furniture in the Tampa, St Petersburg, Orlando, Ormond Beach & Sarasota Florida area.